Goa is not only popular for its fish & seafood specialities but is also known for its meat preparations especially pork & beef. Roasts & chilli fries are loved & enjoyed throughout the year irrespective of festive occasions. 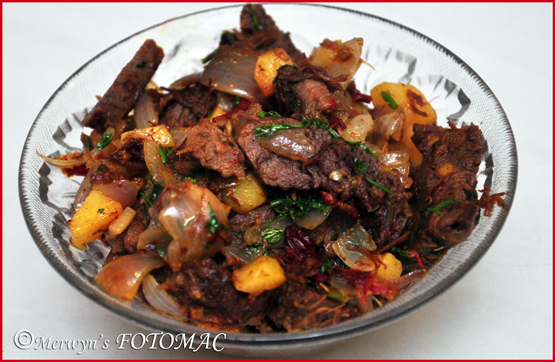 Today’s post is a Goan Roast Beef Chilli Fry. The best part of a chilli fry is that you can fix it instantly & in a jiffy. You can make it very spicy with lots of green chillies or reduce the heat by discarding the pith & seeds. You may add fried potatoes or boiled potatoes in the chilli fry or serve with mashed potatoes, baked Hasselback Potatoes or French fries on the side. You can make it more flavorful by adding spice powders & lots of fresh coriander.You may even used crushed or broken dry red chillies in the chilli fry or use fresh red chillies too. It is all up to you as to how you would like your chilli fry to be! Lemon/limes or vinegar adds in that bit of tang to a chilli fry. You can enjoy as a starter or as a light meal bread or a pulao. This Goan Roast Chilli Fry is wonderful as a light lunch, or as great picnic sandwiches with Hasselback Potatoes or enjoy as an any time snack or even a starter. Wash the chunk of beef & drain well. Pierce with the fork all over the meat. Rub ginger-garlic paste, turmeric pwd., lemon juice & a little salt all over the meat. Marinate for about 4 hrs. or preferably overnight in the fridge. Heat the pressure cooker body with oil/ghee till hot. Add broken dry Kashmiri chillies, peppercorns, cloves, cinnamon sticks, bruised ginger & sauté well. Add the marinated beef & sauté till the meat is browned on all sides. Add 1 cup water or more if required. Pressure cook upto 4-5 whistles till the meat is tender. Let the cooker cool down & then open it. If there is excess water then let the meat cook with the pan open. Reduce till the gravy is thick. Let the meat sit in the gravy till it absorbs the flavors. You may baste the meat with the thick gravy from time to time. When the chunk of roast cools down then proceed to prepare the chilli fry. ½ tsp. Black Pepper pwd./White Pepper pwd. Reduce heat & add the green chillies, garlic-ginger & fry briefly. Add the drained cubed potatoes, turmeric, some salt & fry till the potatoes are cooked through. Add the chopped onions & sauté till translucent. Then add the chopped tomatoes & a pinch of sugar & cook till soft. Add sliced/cubed roast beef, pepper pwd. & give it a good stir. Add some of the roast gravy if you like & stir well. Reduce heat & adjust salt to taste. Serve hot garnished with freshly chopped coriander leaves. Enjoy with bread, pav, any Indian bread or on the side with pulao. Hilda, as a fellow goenkar (but Goan-American for more than 20 years!! ), I just want to thank you for sharing your fantastic recipes with this Goencho. My American wife and family also love it !! God Bless you and all those you love. It is an amazing recipe, tried it out this weekend & turned out really well. Thank you & God Bless You..
Lovely recipe..i was looking for a chicken sausage chilly fry recipe and followed your recipe with only substituting beef with chicken sausages..it turned out great! This dish refreshed my childhood memories where mum used to buy beef from Fort Market(Bombay) and cook it for us for Sunday lunch….but we had it only once a month and I always made sure I was home for this wonderful meal…thanks Hilda..
Hi Hilda. Thanks so much for sharing this recipe. Made it for dinner this evening … I followed your instructions to a T … did add in a dash vinegar too, as you suggested. OMG, turned out absolutely delicious! Devoured by my family in minutes 🙂 Thank you, again! Very succinctly written, with that Goan grace that I recollect in our older generation. I came upon your site while playing out in my head how I would approach it for a class of students: children and their guardians, for a program of NYUs Silver Institutes Food and Family Matters program at WSCAH (wscah.org). I am a designer/artist/illustrator/calligrapher … . Of course, it came about upon remembering memories of my mother making the dish. And as I recollect, it was a tad less elaborate for certain reasons, but we loved it, and to the extent our tongues were learning! Lots of possibilities / subtle modifications as you would certainly know. Much appreciation. can i replace the beef with chicken? Hi Hilda, thank you for this amazing recipe a few times now n it just keeps getting better and better… Hubby drools over your beef chilli fry recipe. It tastes good with anything from chapattis to breads to rice or even kichdi.